Bowhunter Magazine Editor Curt Wells opens the new season with a return trip to Saskatchewan's far north, hunting spring black bears with big-bear guru Rob Nye at Kamkota Lodge. Bowhunter Editor Curt Wells joins Andy Cardwell and the Muzzy Bowfishing team for some high-flying nighttime action for silver carp. Bowhunter Sales Manager, Jeff Millar, heads to the Texas Hill Country for a true mixed-bag hunt with Keith Miller's Texas Trophy Whitetails. 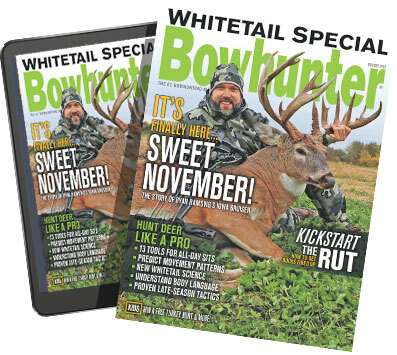 Bowhunter Assistant Editor Brian Fortenbaugh and Publisher Jeff Waring give it their best in snow and ice covered Montana. Matt Palmquist lives his dream to hunt big Canadian bucks and takes a brute of a buck with well-known Saskatchewan outfitter Rob Nye. Brian Fortenbaugh heads back to Canada and proves once more the deer hunting in Goodsoil, Saskatchewan, is great!